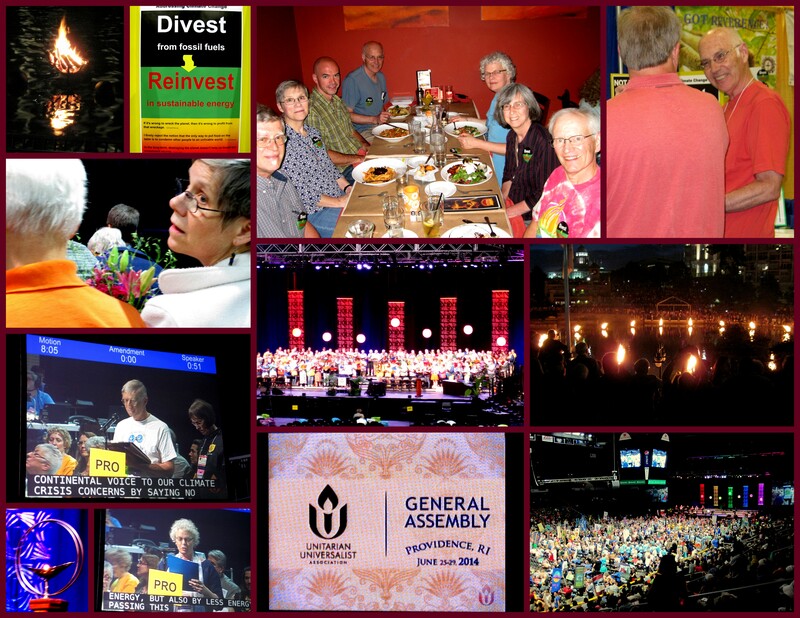 Unitarian Universalists for Fossil Fuel Divestment and Sustainable Reinvestment | News and information about the divestment movement within the Unitarian Universalist denomination. Where is the UU Divestment Movement? Having passed our resolution, we have been so quiet on our list lately. (My main excuse is that it’s been summer gardening and harvest/preservation time). Now we’re in our implementation phase, and some of us might want and be able to return to action. Is there action on the home front (your congregation) or in your district or region that you can tell us about? Or are there other congregations to add to our list of divesting congregations? Please do tell! We love to hear bragging when it comes to UU divestment. I thought about specifying districts or regions in this query, but, given that they are entities of the UUA, I’m assuming that they are taken care of by the resolution we passed at General Assembly. I’ve been collecting ideas that have been submitted to the list. What I’ve come up with is below; please let me know if I omitted anything. “We can write letters to the editor [LTEs] about divest-reinvest and if they are published, forward a link to the group.” She goes on to say she’s “read that even if a letter isn’t published, it’s important in giving the paper insight into public opinion.” I’ve heard the same thing, so I also encourage LTEs. The Citizen’s Climate Lobby has put out some good info on getting an LTE published at http://citizensclimatelobby.org/development/options-for-action/get-published/. Provide an opportunity for congregations that have already pledged to divest to help other congregations that wish to do so. Keep our website up to date with useful divestment information. Continue as a discussion group to trade info/ideas that would help other aspects of the divestment movement. Examples: college divestment, state and municipality divestment, personal divestment. Make sure UUA keeps up the pressure. Help support shareholder activism. Everywhere that Ceres and UUA show up there could be a rally outside supporting their efforts. Some UU churches that still need to be approached to divest. One in southern California that still has oil wells (not just investments in ff companies) in its endowment. Many others have not even begun the conversation. Can someone make a list of the biggest undivested churches? What about the Veatch Fund? Is Shelter Rock UU divested? UU Divest, the CSRI and IC, and others we recruit or cooperate with (350.org?) launch a campaign directed at selected mainstream investment houses to get them to offer more and better fossil-free investment vehicles, both for institutional investors like the UU endowment and for retail investors. Follow up with UUSC – have their financial people gotten the word? Examine the possibility of divesting the UU Pension fund (which may serve UU staff, ministers, and4 staff at congregations). Submit a program proposal/workshop application to your region or district. Co-submit a program proposal with me for GA 2015, in Portland, OR. The theme is “Building a New Way,” which is perfect for a workshop on personal and congregational divestment. Did I leave an idea out? What is it? Shall we narrow down the list? Shall those of us who are interested volunteer for these actions, depending on interest and qualifications? Does anyone think we should do a conference call? This entry was posted in News on October 25, 2014 by wernsber. Thanks so much to everyone who helped make this happen. Here’s a collage that my partner, Gerri Wiley, put together of pictures she took at GA. This entry was posted in Uncategorized on July 26, 2014 by wernsber. Spring is finally here, and we’re hoping that it’s true that April Showers bring May flowers. And Sunshine. And warmer temperatures. In addition, the Board charges the team of Julian Sharp, Larry Ladd and Donna Harrison with crafting the Board statement supporting the proposed business resolution. This statement should make clear that The Board supports the resolution as written. To the extent that changes are proposed during the mini-assembly process, the Board will support those changes only if they are agreed to by the same parties who crafted and agreed to the proposed resolution. We hope this means that at General Assembly (GA), we will have little to no problem passing the Fossil Fuel Divestment Resolution that we worked so hard to prepare, negotiate, and petition to put on the agenda. Before GA, we are working to encourage people friendly to our resolution to register and to seek to be delegates from their congregation, either in person or electronically (a.k.a. off-site delegate). At GA, we will have a table at the UU Ministry for Earth booth in the exhibit hall. It will be staffed by volunteers from our group. Our group will likely be wearing buttons that say something like: Ask Me about Divestment & Reinvestment. We will be implementing a social media strategy, both before and at GA.
We will be implementing a print media strategy, both before and at GA.
We will be connecting with any UUs we know, and encouraging them to vote for the resolution. We are anxiously awaiting publication of the GA schedule, which will happen in May. The time that the resolution will be voted on may well impact the plans we make. This entry was posted in News on April 29, 2014 by wernsber. Trustees decided that it was not necessary. inadequately informed about the resolution. – But I want returns on our congregation’s endowment to be maximized! – I think this is something government should do. (Answer: Agreed. on the board either personally or by reputation? Please send me your nominations. This entry was posted in News on March 5, 2014 by wernsber.